Global energy consumption is expected to increase almost 50 percent between 2010 and 2040–from 549 quadrillion British thermal units (Btu) in 2010 to 815 quadrillion Btu in 2040. Developing Asia accounts for more than half of the increase as its population and economies expand. 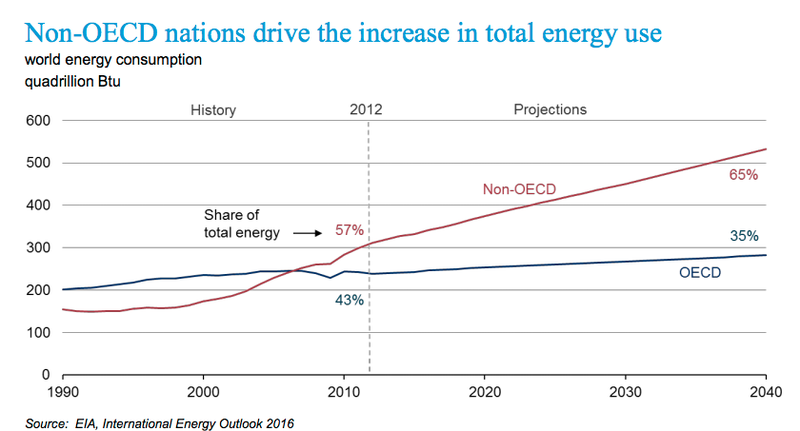 The non-OECD (Organization for Economic Cooperation and Development) countries consume 65 percent of total world energy consumption in 2040—up from 57 percent in 2012. The industrial sector accounts for the largest share of delivered energy consumption, consuming over half of the world’s delivered energy in 2040. 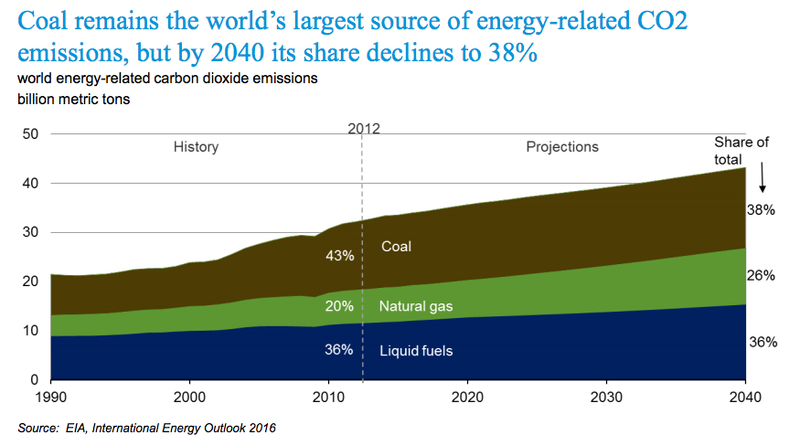 Petroleum and other liquid fuels remain the largest source of energy through the forecast period, but their share drops from 33 percent of the world’s consumption in 2012 to 30 percent in 2040. Most of the growth in liquid fuels consumption is in the transportation and industrial sectors. Although advances in nonliquids-based transportation technologies are expected, they are not enough to offset the increasing demand for transportation services worldwide. 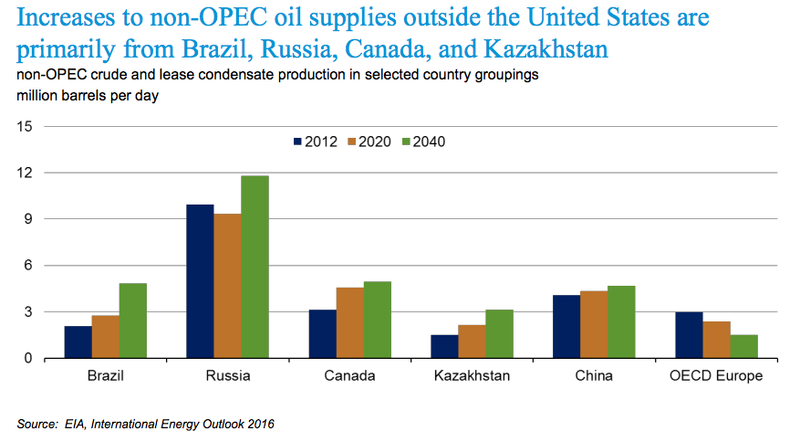 Growth in oil production comes mainly from the Middle East, Brazil, Russia, Canada, Kazakhstan and the United States. EIA assumes that countries in the Organization of the Petroleum Exporting Countries (OPEC) will invest in incremental production capacity to maintain a 39 to 43 percent share of total world liquids production through 2040, consistent with their share over the past 15 years. Natural gas is the fastest-growing fossil fuel in EIA’s international outlook—growing at 1.9 percent per year due to abundant natural gas resources. 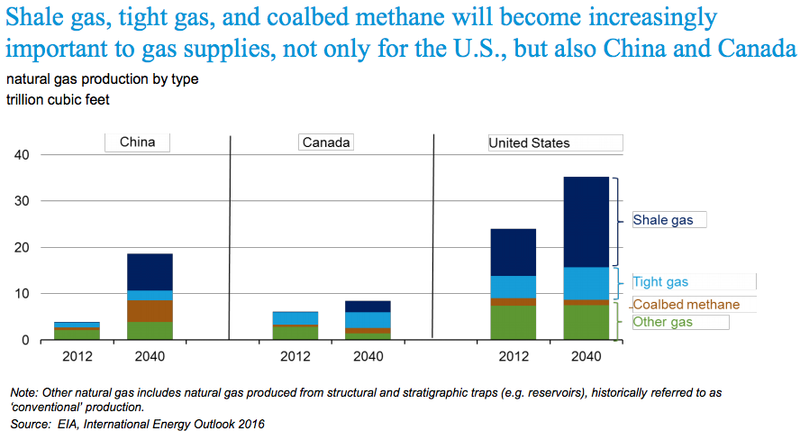 Sources of tight gas, shale gas, and coalbed methane contribute to its increasing production throughout the forecast period. 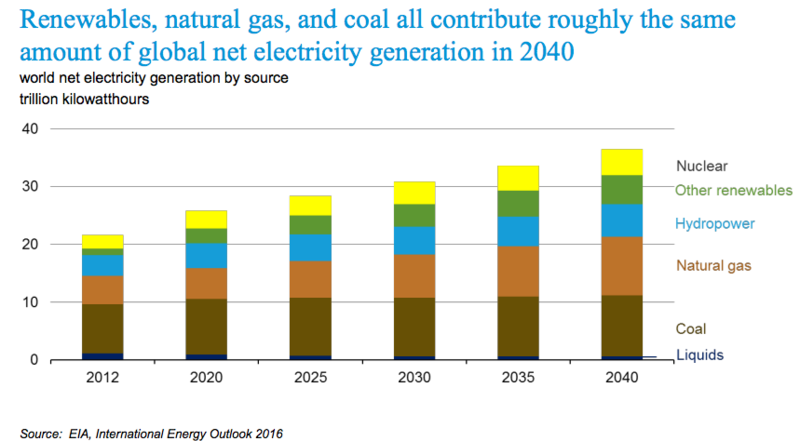 Natural gas surpasses coal to become the world’s second-largest energy source after liquid fuels by 2030. Liquefied natural gas (LNG) is expected to play an increasing role in world natural gas trade. 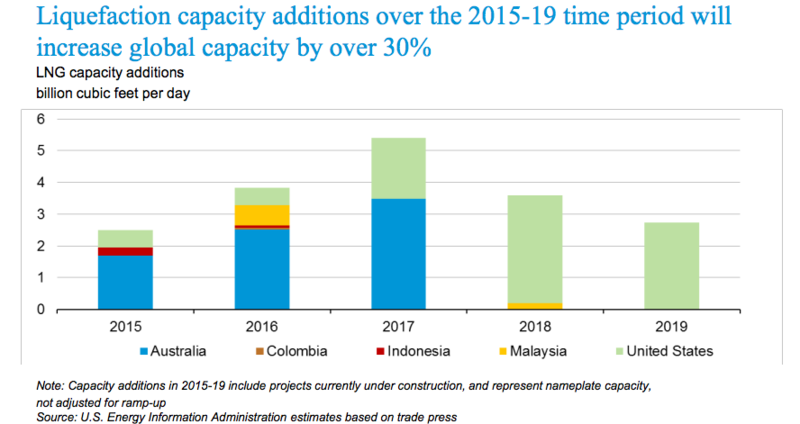 Projected LNG capacity additions, based on those currently under construction in Australia, Colombia, Indonesia, Malaysia and the United States, are expected to increase total worldwide LNG capacity by 30 percent between 2015 and 2019. 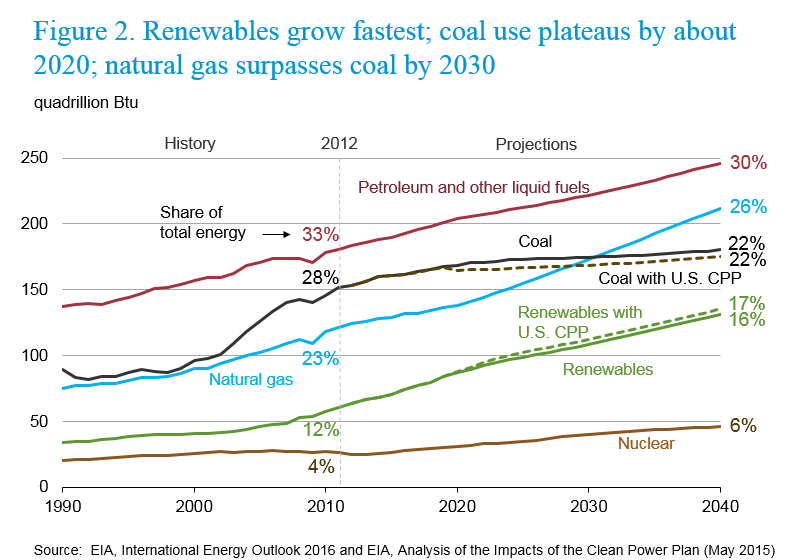 EIA projects that coal will be the world’s slowest-growing energy source, increasing by 0.6 percent annually through 2040. The top three coal-consuming countries—China, the United States, and India—together account for more than 70 percent of global coal consumption. China currently accounts for almost half of the world’s coal consumption, but EIA expects China’s coal consumption to stabilize and decline in the later years of the projection due to a slowing economy and the implementation of policies to address air pollution and climate change. India, however, is expected to increase its coal use throughout the forecast period. While coal is expected to be the world’s largest source of energy-related carbon dioxide emissions through 2040, EIA expects its share of global carbon dioxide emissions to drop from 43 percent in 2012 to 38 percent in 2040. In contrast to coal, renewable fuels are expected to be the world’s fastest-growing energy source—increasing by 2.6 percent annually through 2040. Coal, natural gas, and renewable energy provide about equal shares of global electricity generation—each at almost 30 percent–by 2040. Hydropower and wind energy are the two largest contributors to the increase in renewable energy generation worldwide, together accounting for two-thirds of the total increase between 2012 and 2040. Hydropower and wind generation each increase by about 1.9 trillion kilowatt hours. Electricity generation from nuclear power almost doubles between 2012 and 2040, increasing from 2.3 trillion kilowatt hours in 2012 to 4.5 trillion kilowatt hours in 2040 due to concerns about energy security and greenhouse gas emissions. China leads the world in the addition of nuclear capacity, according to the EIA, adding 139 gigawatts between 2012 and 2040. 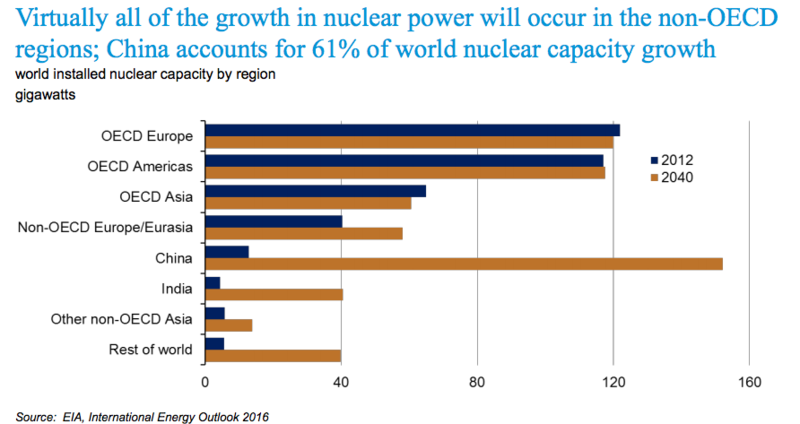 Virtually all of the projected net expansion in the world’s installed nuclear capacity occurs in the developing world. Despite the “keep it in the ground” folks who want to “break free” from fossil energy entirely in global energy consumption, fossil fuels (oil, natural gas, and coal) are expected to supply 78 percent of the energy used in 2040, according to EIA’s International Energy Outlook 2016. Clearly, the world currently relies on fossil fuels to heat our homes and businesses, to transport us from home to work and our supplies from production facilities to retailers, and to help manufacture the products that we consume and produce the foods that we eat. According to EIA, this dependence will clearly continue in the future despite substantial growth in both renewable energy and nuclear power.